The TRX Suspension Training is the original, best-in-class workout system that leverages gravity and your bodyweight to perform hundreds of exercises. You're in control of how much you want to challenge yourself on each exercise - because you can simply adjust your body position to add or decrease resistance. The TRX Suspension Training delivers a fast, effective total-body workout, helps build a rock-solid core, increases muscular endurance, and benefits people of all fitness levels (pro athletes to seniors). Thousands of people at all fitness levels now train on the TRX: From everyday people who just want to feel and look their best to some of the world's most elite athletes. The TRX is used routinely by all four branches of the military, and can be found in the locker rooms of Major League Baseball teams, National League Baseball teams, UFC fighters, Olympic-level cyclists, swimmers & runners. 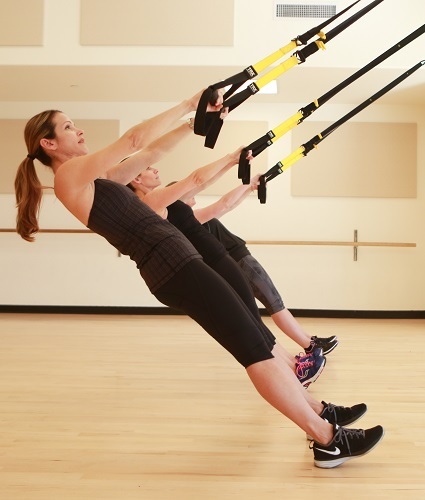 TRX is like no piece of equipment you will find in your traditional "Big" Gyms. TRX is an exclusive piece of training equipment like no other! With TRX, your body is your machine! Born in the Navy Seals, TRX Suspension Training challenges your body in every way possible. You develop strength, improve your balance, lengthen your muscles, increase your flexibility, and best of all, works your core (mid-section) the entire time you’re working out! Utilizing the TRX straps and you're own body weight, this class will focus on strength and core to push your body to new levels. Our time-based workout will accommodate all levels from beginners to the elite athlete while giving you multiple options of exercises to work on your individual needs. Multiple sets will consist in each block of work to maximize your burn! The most efficient strength and core workout you'll ever need!!! If new to TRX, plan to arrive 5-10 min early for overview of set-up techniques.